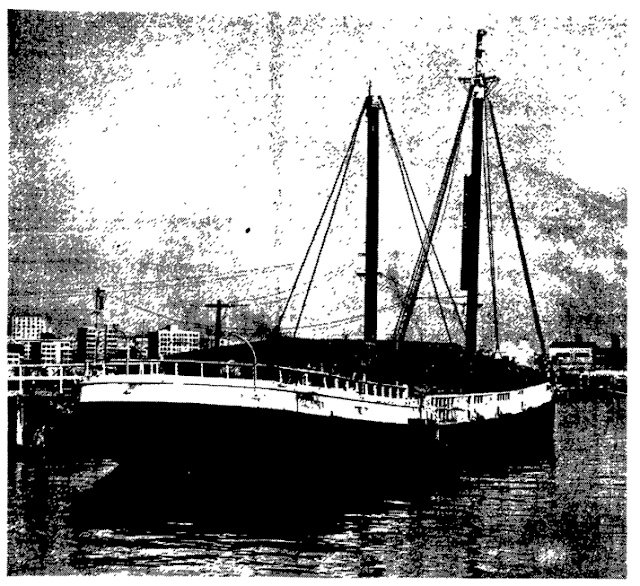 Avondale local historian Eric Waterfield told me the other day about a floating cabaret which once graced the Auckland waterfront during the late 1930s, and pointed out an image of the ship as appeared in the Weekly News. The story begins in 1899, when the four-masted schooner Columbia was built in Hoquiam, Wash. USA by George H Hitchings. She was owned by J H Baxter of San Francisco before World War I, and was sold in 1918 to the City Mill Co of Honolulu, Hawaii. Two years later she was on-sold to another Hawaiian firm. From 1920 to 1926, she was employed in the timber trade between Hawaii and Puget Sound, according to this page. 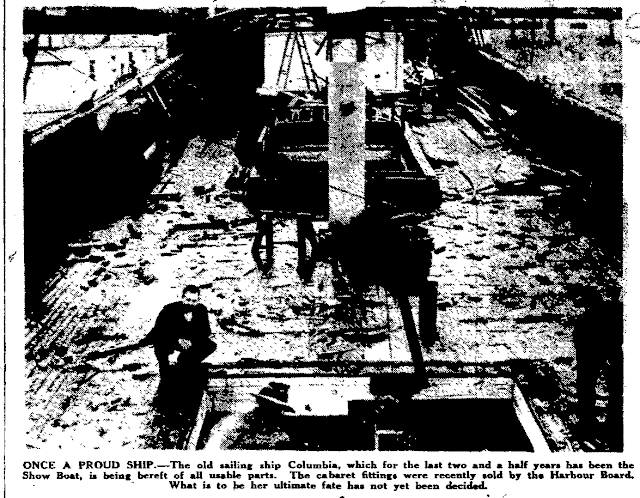 In June 1926, Columbia sailed from Gray's Harbour to New Zeaand with a cargo of lumber, arriving in early August. In September, while she was in Napier, Columbia was purchased by the Devonport Ferry Company, initially thought to be used as a collier, running between Newcastle NSW and Auckland. "The Columbia, which has been at Napier for some weeks, has attracted much attention owing to her graceful lines." (Auckland Star, 3 September 1926) But, the Ferry Company instead wanted Columbia as as a coal hulk at Auckland Harbour, replacing the Genovie M Tucker. The three week last voyage of the Columbia to Auckland was dramatic. 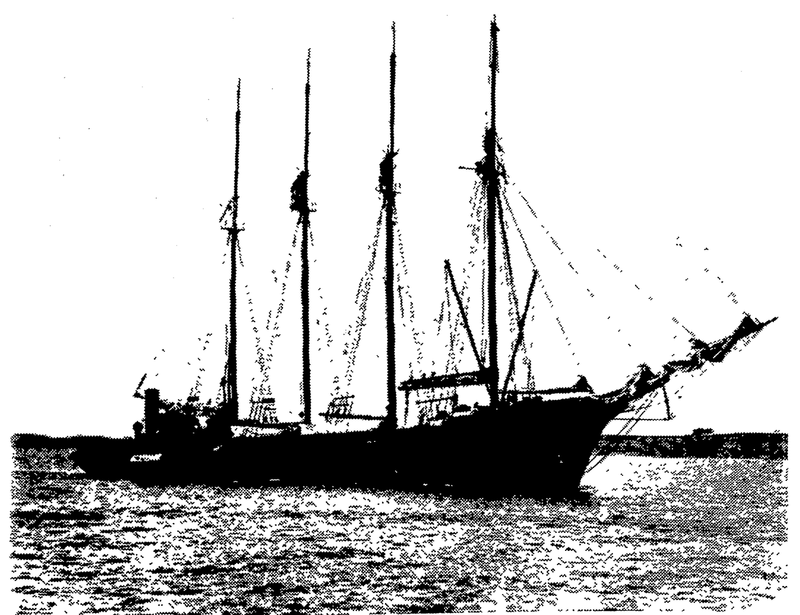 With her provisions and water supply running low, the American four-masted wooden schooner Columbia, which is to be converted into a coal hulk for use at Auckland, reached port this morning, after a tedious passage of 21 days from Napier. After leaving Napier, the Columbia experienced calms and light airs to the East Cape. On September 11, when the ship was rolling heavily and the sails flapping, the spanker carried away and the mainsail was slightly damaged. Having rounded the East Cape the schooner encountered a succession of westerly gales, being driven some 200 miles away from the coast, and so far out of her course that at one time she was almost as far north as the meridian of the North Cape. On September 13 the mainsail carried away during a strong westerly gale. Being in light trim the schooner made hard work of her sailing, but eventually again got back on her course. On September 17 and 18 mountainous seas were running, the ship being badly knocked about, although, with the exception of several ripped sails, no damage was done. However, she was driven another 90 miles out of her course. Early last week the conditions moderated, and the crew were employed in tidying up and mending the torn sails. Head winds were then experienced almost to port, the first fair wind of the trip being picked up yesterday afternoon. This morning the schooner was taken in tow by the Simplon. Owing to the bursting of a 3000 gallon tank on Friday last, the ship's fresh water supply became low, the crew being restricted to one gallon a man per day. Provisions also showed signs of giving out, all the potatoes being used several days ago. Her gear was auctioned off in October, and by the end of the month Columbia began what many probably thought would be the last chapter of her story, as a coal hulk for the Devonport Ferry Company anchored off "Rotten Row" in Freeman's Bay. One of her masts went overboard during a nor-easter gale which struck in May 1934. Then, in late 1935, she was sold to what was termed an American cabaret company by the local press (although one of the partners, M H McLennan, apparently came from Vancouver). 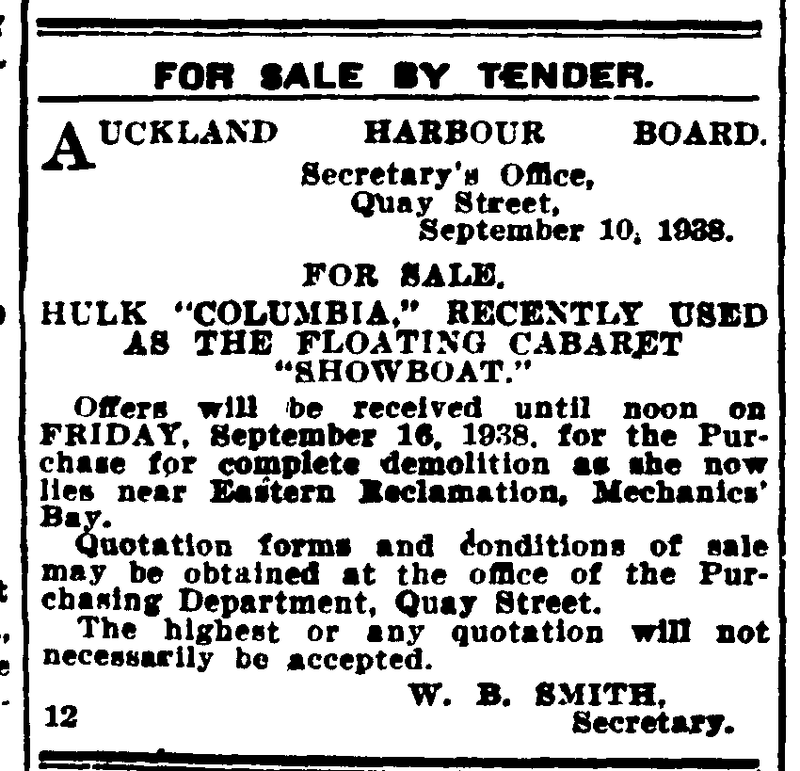 Permission was sought from the Auckland Harbour Board to have the hulk anchored at the eastern reclaimation, near what had once been Luna Park. "I do not think we need be apprehensive regarding the morality or the frivolity of the cabaret," [the chairman, Mr. C. G. Macindoe] remarked. "The people who are running it are experienced in this line of business. There is plenty of room on the reclamation adjacent to where the hulk is berthed for the parking of cars, and it will be under police supervision." ... Opposing the motion, Mr. H. R. Mackenzie said that he did not think that it comported with the dignity of the board or of the city to have a floating cabaret on the harbour. He was supported by Mr. Harvey Turner, who said that the suggestion that overseas visitors wanted to attend such a cabaret was nonsense, as those who were passing through by trans-Pacific liners usually stayed only one day. On the suggestion of Mr. M. H. Wynyard, the chairman included in his original motion a proviso that the license should be subject to the Health Department's approval. "The people of Auckland have a right to have places of amusement at their command," remarked Mr. J. Sayegh. "In any other country there would be half a dozen such cabarets on the waterfront, which is the heart of the city." ... "I would rather see my children visiting a well-lighted cabaret on the waterfront than those that are hidden away in remote parts of the city," declared Mr. Macindoe. "The police will have access at all times. We are concerned only with granting a license, and I doubt if we have power to refuse it." The Show Boat cabaret, Columbia's final chapter, was opened in January 1936. Interesting that, in the ad below, they have used an image of one of Columbus' ships from 1492. Something novel in the way of dancing surroundings are to be provided by Auckland's first floating cabaret, "The Show Boat” which will open on Saturday night. This new place of entertainment was once a four-masted schooner, and more recently a coal hulk, but has now been transformed into an attractive and enticing cabaret, reminiscent of show-boat days on the Mississippi. Two dance floors have been built, one above the other, giving a floor space of about 6000 ft, while cubicles, tables and lounges have been installed. Coloured lighting and tasteful decorations will add to the effect, and a band has been formed that should prove a worthy addition to Auckland's dance combinations. 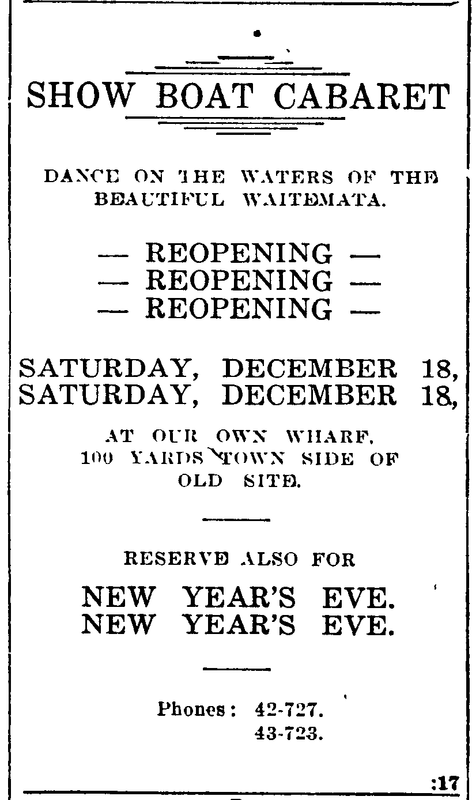 To dance in most pleasing nautical surroundings, in the cool and refreshing atmosphere of Auckland's beautiful waterfront, will be the privilege of cabaret patrons on and after Saturday next, when the recently-licensed floating cabaret, "Show Boat," will be opened to the public. A gala night has been arranged for Saturday evening, when patrons will be assured of three hours and a half of most enjoyable entertainment. It is believed by the promoters that the uncommon attractions of "Show Boat" will make for a full ship. There is a spacious dancing floor on the top deck and another, of the same size, on the lower deck. Both dancing floors are lined with alcoves, furnished with tables which fold back against the walls. Portholes and nautical effects keep the cabaret in character, and the harbour view glimpsed through the portholes serves to heighten the effect. Both dancing floors will be brilliantly lit. For'ard there is a large kitchen and servery, and at the stern there is cloak-room accommodation. The band will be on the lower deck, in an alcove on the port side, and the music will be amplified by loud-speakers throughout the ship. The dancing floors have been specially built, the old decks of the boat having been stripped. A modern system of cooling has been installed, and large electrical fans will help keep the atmosphere pleasant for dancers. "Show Boat" will be moored permanently alongside the eastern extension, under shelter of the tide deflector, so that even in stormy weather all will be snug aboard. Parking accommodation for the guests' cars has been arranged. As the vessel is moored at the end of a good road, only recently completed, motorists will have no difficulty in "Show Boat" is only 200 yards past the Devonport vehicular ferry landing. 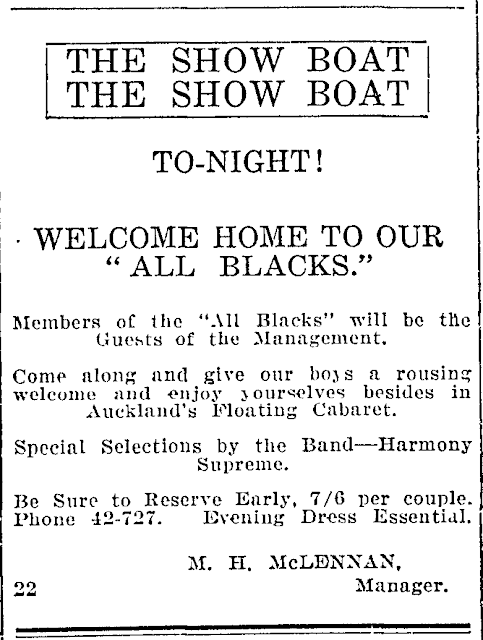 The manager, Mr. M. H. McLennan, is well-known to a large number of Aucklanders, having long been associated with cabaret life, and patrons will be assured of a warm welcome and efficient service. An advertisement in this issue gives particulars regarding reservations. At some point, the Show Boat was moved to Mechanic's Bay. 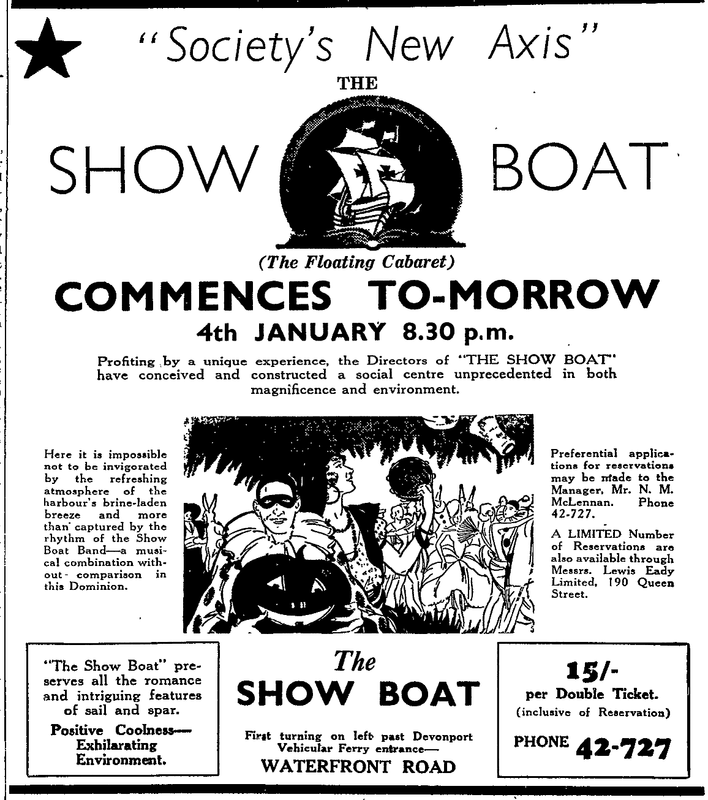 In November 1936, however -- Auckland's floating cabaret was sabotaged. With eight auger holes in her starboard side below the water-line, and 3ft of water covering the ballroom on the lower deck, the "Show Boat," well known Auckland floating dance club, berthed at the eastern reclamation is resting on the harbour bottom, with an acute list. The holes were bored maliciously during the night. The damage was discovered last night by Mr. L R Fountain, a member of the staff, who was on night duty at the time. He went aboard about 11 o'clock to find that, in his words, “Water was simply pouring in through the side of the ship on to the dance floor.” The management summoned the police this morning. Mr. Fountain communicated with Mr R Fenwick, manager of the Show Boat, and the secretary, Mr. N. E. Crowe, and the furnishings on the dance floor were removed to the shore, where they will be stored. Nothing could be done last night, but an investigation was made this morning, and a powerful pump was installed this afternoon. Mr. Fenwick was aboard about 5 o'clock last night, when everything in order. The damage apparently was done between 9 p.m. and 11 p.m.
Investigation to-day was undertaken when the tide had fallen sufficiently to allow an inspection of the under-water portion of the hull to be made. About 11 o'clock the vessel was resting on the bottom, with a heavy list to starboard, with the water still high enough to be running out of the port side, alongside the reclamation. Mr. Fenwick, rowed round to the port side in a dinghy, and there, clearly visible because of the list, were to be seen the auger holes, There were eight of them bored in a circle of a diameter of 1ft. Three of the holes had penetrated, but the others had struck iron bolts. Evidences of leakage were found as long ago as last Wednesday week, although at that stage it was thought that defective caulking was the cause, because that seemed feasible in an old vessel. However, when, an examination was made this morning, tiny-fish were found in the interior below the dance floor deck. It is stated that fish could not easily enter through chinks in the caulking. "It looks to me," said Mr. Fenwick who, when he spoke, was clad in a bathing costume, and held a hammer in one hand and a piece of wood in the other, "that a malicious attempt has been made to damage the business of the Show Boat. 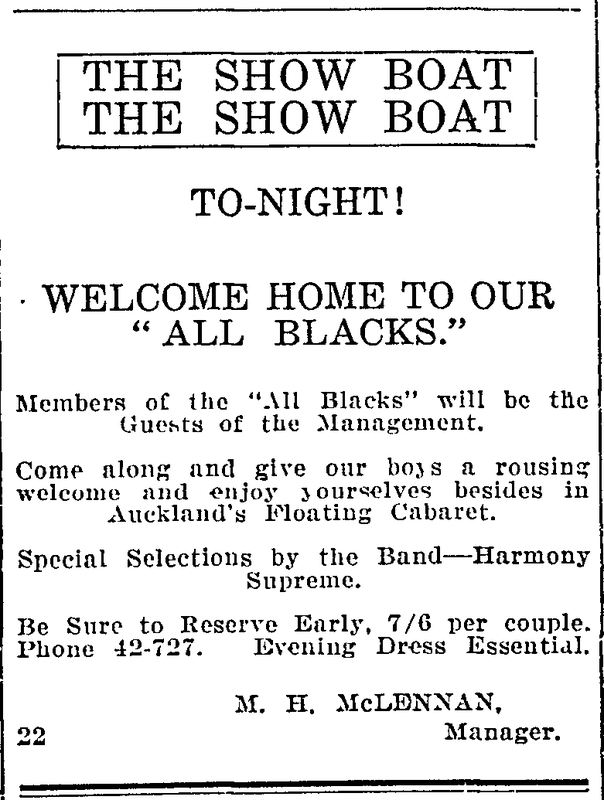 I think we can say the Show Boat has become a popular institution in Auckland among the younger set, but I cannot imagine that anyone would have gone to such lengths as to do this. It is a criminal offence. The manager added that, although he was not a carpenter, it seemed obvious to him that the augur holes had been newly bored in the stout timbers of the old ship. Obviously the malicious work must have occupied some time. Some idea of the popularity of the Show Boat may be gained from the fact that a fortnight ago the club was booked to capacity, and last Saturday over 300 members and guests had to be turned away because the ballroom floor, owing to flooding in that week, was not sufficiently dry for use. The management team repaired the damage, but then the Harbour Board wanted the cabaret shifted to make way for the new Pan-American Airways base at Mechanics Bay. The Show Boat was shifted to "the rubble wall which is a distance back from the Mechanics' Bay breastwork, and parallel with the power boat dolphin piling. A wooden jetty will be erected between the shore and the ship." (Auckland Star 1 December 1937) It reopened the week before Christmas. Whoever had it in for either the owners or the ship -- they struck again in March 1938, just over two months later. The floating cabaret, "The Showboat," moored at the eastern reclamation, was found sinking late yesterday afternoon. The lower deck ballroom was flooded with thousands of gallons of salt water, which caused extensive damage. An attempt was being made to float the cabaret this afternoon at low tide, but it was impossible to do anything until the water had gone down sufficiently to allow the Harbour Board pump to be used. A passer-by noticed the position of the craft late yesterday afternoon and advised the proprietors. By reason of the rapidly rising tide the water had risen to within 6in of the ceiling above the lower deck by 5 o'clock and was rising at the rate of 2ft an hour. It was impossible to draw off the water with a pump supplied by the Harbour Board staff, as the water was flowing in too quickly. One of the square glass windows built into the seaward side of the boat was smashed and the frame floated on the water, and it seemed likely that some or all of the windows on that side of the ship had been deliberately broken. The actual cause of the trouble, however, as stated this morning, is a complete mystery. A grand piano was covered by about 10 feet of water and the tops of trestles, covers from gramophone records, and fittings from the interior of the cabaret floated up against the ceiling. By seven o'clock last evening the water in the lower deck of the cabaret had risen to the top of the stairway and was running over the upper floor. However, everything had been lifted out of the way. The vessel settled on an even keel last evening. The cabaret has had an unlucky series of accidents of which this one is the fourth within 18 months. Between the beginning of October and the end of November 1936, three allegedly deliberate attempts were made to sink the ship. On the first occasion one of the forward mooring chains was released from the capstan, but though the tide movement snapped a steel hawser, a thick rope held. A month later, someone tried to flood the craft, but the rising water was detected. A fortnight later, however, 11 augur holes were bored below the waterline. The damage on that occasion amounted to about £200. As the Show Boat cabaret, which had been raised only a few hours previously from the sea bed and cleared of the water that had flooded its lower floor, lay alongside the eastern reclamation at noon to-day, a little crowd of people in a Queen Street auction room heard it withdrawn from sale when the highest bid of £120 failed to reach the reserve. The floating cabaret was offered complete with fixtures and fittings, piano, tables, chains and general accessories. There were only two serious bids, the first being £100. The reserve was not disclosed. When the discovery was made on Tuesday that the Show Boat was sinking it was thought that the mishap might upset plans for the auction. A piano and other fittings suffered from the effects of the inrush of salt water. However, the arrangements for the sale, under the instructions of the debenture holder, were continued. Whether private negotiations will now begin or another auction will be arranged could not be ascertained to-day. The cause of the sinking of the cabaret at its moorings remained to-day a mystery. The vessel was refloated early last evening, and a cursory examination failed to reveal any reason for the mishap. A fuller inspection has yet to be made. The Show Boat was refloated, but soon after her owners decided to abandon the whole operation. 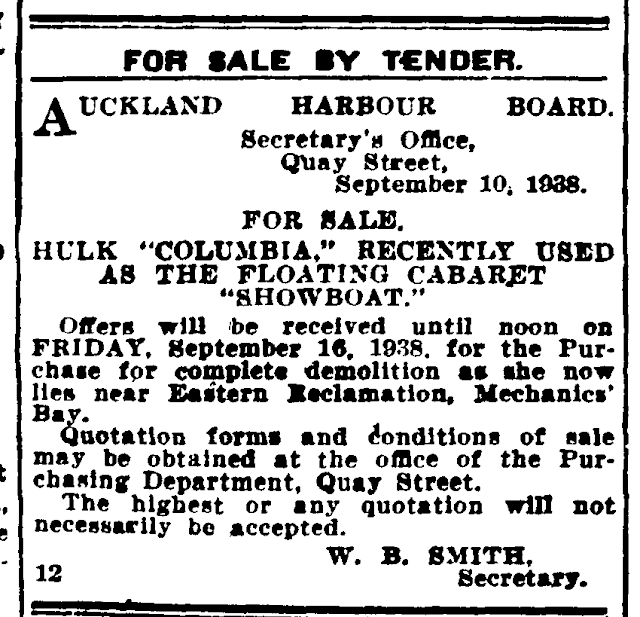 She came under Auckland Harbour Board control by August 1938, and for the second time in her career, the Columbia's fittings were auctioned off. In the near future the old Showboat, which has been moored for a considerable time at Mechanics' Bay, is to make her last voyage. The hulk, which was formerly used as a cabaret, is to be towed to Rangitoto Island and destroyed by fire. Officials of the Auckland Harbour Board have examined the vessel, which was formerly the schooner Columbia, and it is considered that in calm weather the tow can be made without difficulty. Prior to setting out on her last voyage the hulk will be loaded with an amount of inflammable material. Recently the Auckland Harbour Board called tenders for the removal of the vessel. One offer of £10 was received, but as a condition was attached that a period of 12 months should be allowed to dispose of the hulk the offer was declined. The Showboat contains in her hull a large amount of heavy timber, but the bolting used in her building would make her a very difficult vessel to break up. Now that a decision has been reached with regard to the destruction of the "Showboat" by setting her on fire, please allow me to suggest that it take place on the evening of Anniversary (Regatta) Day. Being a holiday, a very large number of people could witness a thrilling and instructive spectacle. In the end, Columbia returned to Rangitoto's waters, where she had first passed back in 1926 on her journey to Auckland. The old schooner Columbia, which had been used as a floating cabaret, was towed to the northern end of Rangitoto Island yesterday, beached, and destroyed by fire. The tow was made by the Auckland Harbour Board's tug Te Awhina and off Rangitoto that tow was transferred to two launches. Inflammable material on the bulk was set alight, and the vessel was soon a mass of flames. The hulk was burning throughout the day and was completely destroyed. Today, Columbia's remains join others as part of the Rangitoto Ships' Graveyard. That's a sad ending for such a fine vessel. Good to see the photos of her. I remeber coming across the article about the auger holes drilled in her hull. Seems yeah with a second sinking....someone must have had it in for the owners and the vessel was the target. Great story! twenty one days from Napier...wow.